After months of inactivity, Comstock Mining Inc., has stirred in its grave. Rigor mortis finally setting in? A few microbes still alive in its gut? Pure and simple. CMI has become a land speculator, looking also to sell water rights. No more gold or silver mining folks. Even in the face of big debt and zero revenue, the company continues to acquire land through more debt and more dilution of shares . . . all without any mining or any plans to mine. And forget about the Tonogold so-called deal. it’s a total farce. Ask yourselves why in the world would CMI dump the Lucerne if there was still hope it could be mined profitably. And how is Tonogold, a company that has never turned a profit in its history and is deeply in debt, going to come up with tens of millions of dollars to consummate any proposed deal. Don’t fall for pr words like “strategic “ or “incentivise”, look at the numbers and the history. Total farce? Only if no widows or orphans are injured in the process. All that CMI could find to praise itself for is that on September 9 2017, the State of Nevada Division of Minerals recognized its reclamation efforts in Gold Canyon above Devil’s Gate with a nice certificate for the office wall. Having undermined the highway and toppled it into the pit, the company has repaired the damage and then landscaped and groomed the once rugged canyon as carefully as a park. What had been a historic canyon is now as smooth and soft as a baby’s bottom. Despite the charm and visual appeal, things are not pretty in Gold Hill. CMI is now in its ninth year here and has only another quarter with losses again in the millions to show for it. There has been no active mining here since the failed effort underground in the Lucerne Pit. All the action has been in the halls of government, in courtrooms, and at stock brokerages. The hedge fund GF Capital created GF Comstock 2 LP as a vehicle for creating the money pool for CMI to draw from. GF Comstock 2 LP is selling $100,000 participations to other investors. The Agreement filed with the SEC is here. So CMI has mortgaged everything for the cash it needs to carry out its plan to pitmine Silver City. Beyond that it has negotiated a private sale of stock to Leviston Resources LLC expected to produce $2,150,000 in revenue. During the glory days of the Comstock most of the mines were losers. Only a small handful sustained profitability over time. I’m confident that scholars can confirm that CMI is already the biggest loser in the history of the Comstock Lode, sending $227,000,000 of investors’ money — more than a quarter billion dollars! — down the shaft (so to speak) with no dividends for ordinary investors, and still counting as of June 30, 2018. Oh, and about those investors. While Preferred shareholders like John Winfield did extract some cash, those dividends ultimately came from the investments of ordinary shareholders. Anyone who acquired stock in Goldsprings (an earlier name for CMI, which was also called Plum Mining for a while) has been through two reverse splits already. A 200-1 reverse split occurred around the time Goldsprings was taken over and renamed. That and the recent 5-1 reverse split means original investors — if any of them have hung around this long — now have 1/1,000th of the share value they invested in, yet management soldiers on, perhaps encouraged by the big paychecks they write to themselves. Also in January the Company issued 1,475,410 shares of restricted common stock to acquire 25% of the total membership interests of Pelen, LLC for $0.6 million. Pelen LLC, is the 100% owner of the historic Sutro Tunnel Company that owns the Town of Sutro, the historic 6-mile Sutro Tunnel, the federal land grants and mining rights spanning 1,000 feet on each side of the 6-mile span, the rights to the tunnel’s water and the patented mining claims and private lands on Gold Hill. The purchase of the membership interests will close once the seller of the membership interests has received total cash proceeds of at least $585,000 either through sale of the restricted common stock received or through additional cash payments made by the Company. If all of the shares of restricted common stock have been sold and the aggregate proceeds are less than $585,000, then the Company is required to pay the shortfall in stock or cash, at the Company’s election. As of June 30, 2018, the purchase has not closed. The Company recorded a make-whole liability of $0.2 million, representing the value shortfall at June 30, 2018. This Update from November 2017 provides details about the lawsuit filed against CMI and Lyon County when the County refused CRA’s request for electronic communications contained on their personal phones and email accounts. The issue before the Nevada Supreme Court is whether public officials can shield themselves from oversight by using private telephone and email accounts in order to conduct the public’s business in secret. In a separate case, on December 2017 the Supreme Court ruled that Silver City et al. were denied due process by Lyon County because the clearly compromised Commissioners Hastings and Keller did not recuse themselves from the decision to allow open pit mining within the town limits of Silver City. Hastings had received $17,500 from CMI and a couple of California corporations controlled by John Winfield; Keller and her husband had banked more than a quarter million dollars from contracts awarded by CMI. March 27 2018 was another big day in court: the Nevada Supreme Court handed down a unanimous, 7-0 ruling affirming public access to government officials’ personal communication devices and email accounts when they are used to conduct the public’s business. Those ‘secret’ communications on personal devices pertain to CRA’s Due Process complaint, in that Commissioners Keller and Hastings should have recused themselves from voting on the Master Plan and zoning issues that benefited the mining company. Hastings had received $17,500 in campaign contributions from CMI and two California corporations controlled by the then-CMI Board Chairman John Winfield. Vida Keller and her husband Scott received more than a quarter of a million dollars worth of contracts from CMI during and shortly after the time she was a Lyon County Commissioner. CMI complied with the order to provide private communications, but Lyon County refused, and District Court judge, Stephen Kosach denied Comstock Residents’ petition to compel them to do so. That denial was reversed by the Supreme Court and Lyon County was ordered to turn the disputed files over to Judge Estes. The admissible emails and phone records have now been carefully scrutinized. They reveal a pattern of secret intercommunications between CMI and Lyon County officials, both staff and elected. On April 3rd, Vandenberg Management Inc., a major institutional investor, bailed out of CMI. On August 31st CMI announced its plan to pitmine Silver City. Presumably this will resolve the company’s troubles. The company’s stock debuted at $3.27 back in 2010. It soared initially as high as $20.70, but then faltered and in the years since has now twice fluttered below 20 cents a share. The collapse from twenty dollars to twenty cents took eight years and numerous stock offerings gleaming with golden promises, and I believe it has made Comstock Mining Inc the biggest loser in the rich history of the Comstock Lode. Eight years of losses while tearing up Gold Canyon and making an everlasting mess in American Flat. Twenty cents is a threshold at the SEC; a stock that passes through 20c on the way down and stays there for a month gets a notice giving the company six months to bring the share price back above 20 cents or do a reverse split to force it up. In response CMI executed a 5-to-1 reverse split on November 11 2017, and as a consequence the price per share shot back up to 70 cents. Once there it resumed its steady downward course, requiring just eight months to find its way back to the 20 cent marker on July 26 2018. On August 27 2018 CMI was again served with the same dreaded demand from the SEC: get your share price above 20 cents no later than February 27 2019, or be delisted. The Company’s common stock continues to trade under the symbol “LODE,” but with the added designation of “.BC” indicating that the Company is below compliance with this NYSE listing standard. Once again the clock is ticking off the minutes, each day a new page is torn off CMI’s calendar, each month Corrado De Gasperis rewards himself with another nice check. Tonogold . . . believes that it is important for investors to gain a general understanding of some of the Resource issues that have come to light during Tonogold’s due diligence program, and to be aware that this is expected to result in a significant reduction in the Resource as currently reported by Comstock . . . there is evidence that the official resource estimate may have been overstated by over 30%. Despite that misrepresentation, Tonogold is going forward with the joint venture, perhaps because it had some eager investors on the string, perhaps because it just needed something to do. 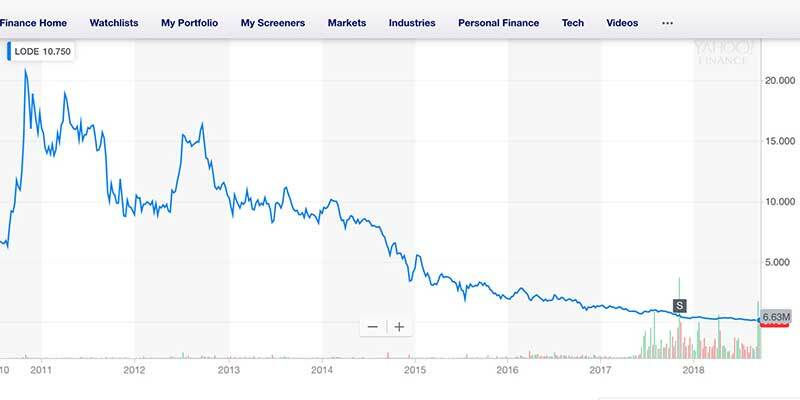 Launched at $2.20 on August 1, 2007, Tonogold’s Over the Counter (OTC) stock has followed the same downward trajectory as CMI’s, sliding to $1.40 in April 2014 and to 11¢ currently. CMI’s share price surged briefly after the one-for-five reverse split last fall, and has now slid back down to 14¢ with no sign of buoyancy. The TonoGold Joint Venture is two leaky boats lashing themselves together in an effort to avoid the inevitable, and slowly sinking into the mud. CMI’s hopes, dreams and prayers of getting out of Storey County scot-free seem dim now, and every future setback will be a reminder of the role the Storey County Commissioners played in this fiasco. If they had listened to the citizens, followed precedent or simply acted with integrity . . . ah, Storey County. Silver Law’s Florida office is targeting the 3d party (large) brokerage firms that sold millions of CMI shares over the years to unsuspecting investors without performing basic due diligence. Instead the brokerage firm just accepted CMI’s lofty upside promises and passed them on. This law firm reps the mom & pop investors (institutional investors), who believe that the brokerage firms misrepresent the share value potential of CMI stock & have essentially defrauded them. He has begun seeking these disgruntled investors as they build their case. No clients at last report, but he says he’s getting interest. June 3 – CMI Annual Shareholders Meeting: Who jumped Who? The grand event was held once again at the Gold Hill Hotel and one of the rumors that ensued is that John Winfield and Corrado De Gasperis had to be separated from a physical altercation. Enjoyable to suppose, but only a rumor until a witness is willing to talk about it on the record. Speaking of the Gold Hill Hotel, a sale is pending but escrow has been extended until December for reasons not specified. Speculation by outsiders is that property records may be murky or contradictory. As part of its unanimous reversal of the initial public records ruling in CRA’s lawsuit against Lyon County and CMI, the Nevada Supreme Court awarded costs to CRA from Lyon County in the amount of of $125,000, arrived at through negotiations in Judge Kosach’s court. This money will go to John Marshall and Luke Busby. Their legal efforts on behalf of CRA began in 2014, and include two successful appeals to the Nevada Supreme Court. Until now they have received no compensation for their work apart from a few gifts and the eternal gratitude of Silver City. John and Luke were assisted in this effort by Joe McCarthy and Erich Obermayr who examined the thousands of emails and pages upon pages of the telephone records (no content of the calls, just date, destination number, duration) to discover the secret web of connection, each phone call, one after another, a nail in the coffin of CMI and its myrmidons. The CRA brief derived from this grueling exercise has been delivered to Judge Estes as required; his decision is expected in October. And in January the company will have just two years before the GF Capital Debenture comes due, with all the company’s assets at stake.